This is the story of a once proud and pristine recreational park near Hamburg, PA. A destination for people of all ages to enjoy outdoor activities. Among them: fishing, walking, picnics, boating, kayaking, a children's play area, horseshoes, quoits, basking in the sun and many other forms of good time socialization. The county of Berks abandoned the area several years ago and in 2014 I took it upon myself to mow grass to keep the area open to anyone who enjoyed fishing at Kaercher Creek....be it a lone fisherman, family or a father or mother teaching their son or daughter the excitement of fishing for the first time. The conditions were terrible. The grass had overgrown to waist high and the walking path had become difficult to navigate. I spent many weeks, months and hours battling the overgrowth--alone--until it was in respectable condition and people could once again enjoy the fishing area without fear of stepping on snakes, stepping in holes or picking up ticks lurking in the tall grasses. In 2015, I continued my mission to do what I could to help 'Kaercher' remain accessible to those wishing to enjoy the fishing area. Cutting grass and trimming when time permitted. In 2016, my mother's alzheimers disease took a dramatic turn and she needed my assistance nearly 24/7. This meant that I could no longer devote any time to 'Kaercher'. After 2 years of hard volunteer, take-it-upon-myself work and expense, the thought of what was happening there while I couldn't attend to it was unsettling. In May, my mother lost her long battle with alzheimers. Part of my healing process involves reconnecting with things that I had done previously, among them volunteering my time at Kaercher Creek. You can guess that after a year of going unattended, the area is right back where it was when I first began in 2014. My tools consist of an old scythe, nippers, lopper and a beat up old lawn mower (mostly due to using at Kaercher) with a hole in the side. I don't even have a trimmer to help with the high grass, hence the scythe. (UPDATE: A Stihl trimmer was donated to the effort by Nancy & Chris Vollmer) If successful through the generosity of others, my gofundme campaign will allow me to purchase the proper tools, strong equipment and gas, while continuing to donate my time and effort so anyone wishing to enjoy 'Kaercher' with family or friends, can do so. Waiting for Berks county to to take action at Kaercher Creek Park has never been an option. In 2015, I met a father fishing with his young son. Using the area I had maintained. After chatting, he thanked me for my efforts, recalled some of the 'glory days' of the park and summed it up by saying "I love this place". Thanks for considering my gofundme campaign. Good Morning, I'm Tim Mazaika. I've organized a small volunteer group called Friends of Kaercher Creek. Kearcher Creek Park is in Northern Berks County and was designed as a flood control and recreation project. I've been fishing there since it opened in 1972 and was there the day the dam was dedicated. I started volunteering at Kaercher Creek in 2014 after Berks County Commisioners decided not to renew their lease with Fish and Boat. It was very overgrown. To the point grass and weeds were waist high due to the neglect. I had to cut it down with a hand scythe before I could even begin to think about mowing....scything close to 100 yards of park side shorline. 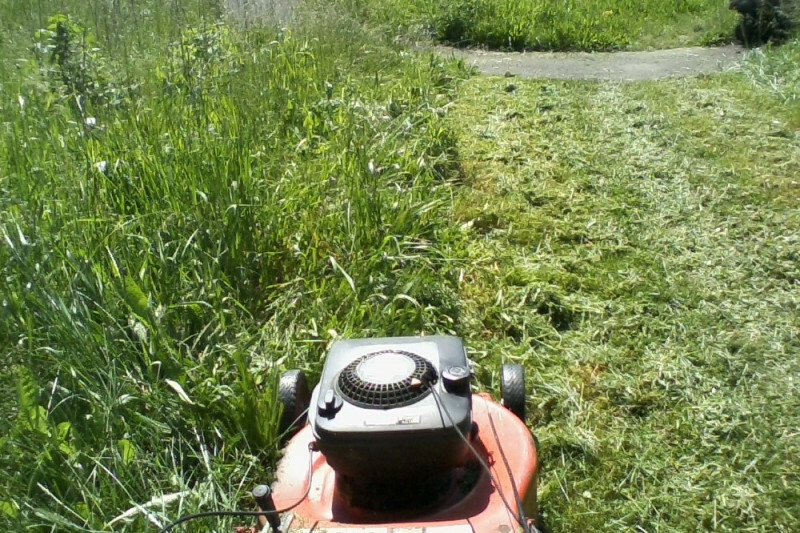 When it was manageable, I used my self-propelled lawn mower and was walking 7 miles every time I cut the grass. My motivation was to open up shoreline area overgrowth and make a 3 foot buffer on each side of a walking path that encircles the old park, for fishermen and families. Families with children. Children being the future of the sport of fishing...the sport of fishing fighting for its life in this day and age of handheld devices and social media. I've donated over 600 volunteer hours since 2014. And paid most of the expenses out of my own pocket. I'm joined today by Nancy Harrigle, who has volunteered over 100 hours of her time to Kaercher Creek. The Outdoors community was so impressed by the effort, they named me outdoor sportsperson of the year in Berks County for 2018. In July, we were told to stop mowing grass. These are our current concerns. An Adopt an Access agreement was proposed to me by the property services manager. One of the requirements was to obtain general liability insurance. It appeared to be cost prohibitive for us and was difficult to find. A policy was finally found, that provided twice the coverage we were requested to obtain... $2 million dollars coverage...which including any damage to the property where we volunteered. Coverage similar to a group of volunteers helping to maintain the Kernsville Dam area, near Hamburg, for D.E.P. During a conference call, I notified the property services manager and maintenance chief I had found insurance and they came back and said it was decided that our being there cutting grass was taking work away from their union employees and there would be no adopt an access agreement. This raised a number of questions with us. I read that Fish and Boat was looking to expand the adopt an access program statewide, so why was our attempt to help voluntarily maintain and provide safe and reasonable access to the park side withdrawn? Why were we singled out for rejection? If our volunteering was deemed to be taking work away from the union crew, aren't all adopt an access agreements doing the same and shouldn't they be terminated statewide for the same reason? Another question that arose was, if suddenly what we were doing was deemed to be taking time away from a couple of union workers, why wasn't the grass being cut...even in a limited way...on the park side after Berks County bailed on their lease? Was work being withheld from these same union employees from 2014 until July of this past Summer, when we were told to stop cutting grass, or be cited? It seemed very odd that the property services manager would drive to Hamburg from Bellefonte and meet with me in 2017, go to the time and expense of producing a GPS survey map of the area we we're working, giving me guidelines for mowing and subsequently presenting me with the Adopt An Access option. Given the history of battery casings used as fill all over Berks County, we wonder if they are still present on the park side, which led to the sudden termination of the Adopt An Access option. I also spoke with the AFSCME District Director. He told me they will and have stepped aside to allow volunteers efforts, but that request must originate from Fish and Boat. I suggested that to the property services manager, but never received a reply. Many people are angry with the Fish and Boat Commission and with Berks County Commissioners for the current situation. One Berks County Commissioner, Christian Leinbach, once called Kaercher Creek Park a gem of Northern Berks County. If you'd visit and tour it today, that's not the word you'd use to describe it. Just 5 days ago, A final Earth Disturbance Inspection Report was issued by D.E.P., concerning the Kaercher Creek Battery Abatement, in an trail area on the boat launch side. The finding was no current violations. We hope that in light of this report, Fish and Boat, along with Berks County officials can begin a dialogue in an effort to end the disagreement which began in 2012....or allow our volunteer effort to be given an Adopt An Access Agreement, so we can continue to voluntarily contribute to the upkeep of Kaercher Creek Park, on a regular basis, until such time as those differences are resolved. The Fall cleanup at Kaercher Creek Park will take place on Saturday October 27th from 9am until 1:30pm. The rain date is the following Saturday, November 3rd, at the same times. Message me if you plan to attend. Volunteers should dress properly, bring gloves and a rake or pruners. There should be lots of raking this time around. We could also use an extra weed whacker, leaf blower and a wheelbarrow or utility tub. Bottled water will be provided and there will be a shore lunch provided for volunteers. Youngsters must be accompanied by a supervising adult. Please arrive by 8:45, in order to sign a waiver. Contact me with any questions. Thanks! Hope to see you at the K.
Update: We have been kicked out of Kaercher Creek Park by The Pennsylvania Fish and Boat Commission. After finally finding General Liability insurance that we could afford-which F&B requested us to obtain-that would've allowed us to continue under an Adopt An Access agreement, they came up with a lame excuse, claiming that the work we were doing was taking time away from their union employees. So in essence, since they failed to go in and do even minimum upkeep on the park side at the K beginning in 2014 when the county left, they essentially withheld work from those same union employees. But suddenly it's an issue. Even now, there are others cutting grass on the property, which by the way, belongs to PA taxpayers, not Fish and Boat, yet nothing has been done about it. Essentially, turning a blind eye to that while targeting us. They've promised to cut every 2 weeks during a meeting over a month ago. They cut once. And only returned today (Thursday) for the second time, irritated because we went back in and mowed due to the weeds growing a foot high in places that we've kept maintained. We were told to remove our garbage can, that it can no longer be there. Visitors and licensed users...Get ready to see an increase in trash laying around. There's some there already. Failed to be picked up. We had to remove the pavers that provided reliable footing at the bottom of the bank at the crossover. Visitors and licensed users, get ready to tread through the mud. Much more to come, including what we'll do with our remaining funds, as the drama unfolds and we've been forced to take the position of a watchdog group.